Did the Secret Work For You? Have you seen the Secret? (Sample photo of an “Npu standing in the Land of Kam” – work of art in progress). Yeah, I know you have. I saw it too. It took the world by storm and everyone was on board about a year ago because of Oprah. The lady who wrote the book really did a good job with the publicity and I give her credit. I hold no ill feelings towards her or her success, but the Secret didn’t work for me. Even though a lot of what the authors talk about makes sense because they are based upon the “Law of Attraction” there are other laws that exist that cancel out the Law of Attraction if things aren’t working together. I promised myself that I was not going to preach, but you know in this book they don’t explain or talk about the Spirit, which the author calls the Genie or whatever. Because they don’t talk about the Spirit (Genie) it sends out a mixed message to people, making them think that all they have to do is think positive. Let me give you an example. One section in particular talks about how if you say “you don’t want” the Universe only hears “you want” such as if you say you don’t want a bad haircut then you will end up getting a bad haircut. Ok? But I am a real pragmatic individual. So, why did the Universe lay me off of my job when I woke up every morning saying because I was tired, “Man, I sure don’t want to go work today”? According to the Secret, the Universe should have said, “HAHAHAHA. Rau Khu is talking silly…he’s just tired. He wants to go to work and have a job“, but it didn’t. My behind was laid off. Before the Secret came out, I was testing this whole attraction thing (before I knew that is what it is called) and I said, “I want $3000 by x, y, z date”. Guess what I got it. It was part of my severance pay!!! So, what does this all mean? Well, there’s a saying…”Be careful what you ask for”. Why do you have to be careful? Because the Spirit or Power of God does not make a distinction between what is right or wrong, right and left, front or back, etc. It’s sole objective is as they say in the Secret to grant our wish, because God gave us freedom of choice to do whatsoever we want to do. If we don’t put any guidelines and aren’t specific on how we want to achieve that goal. 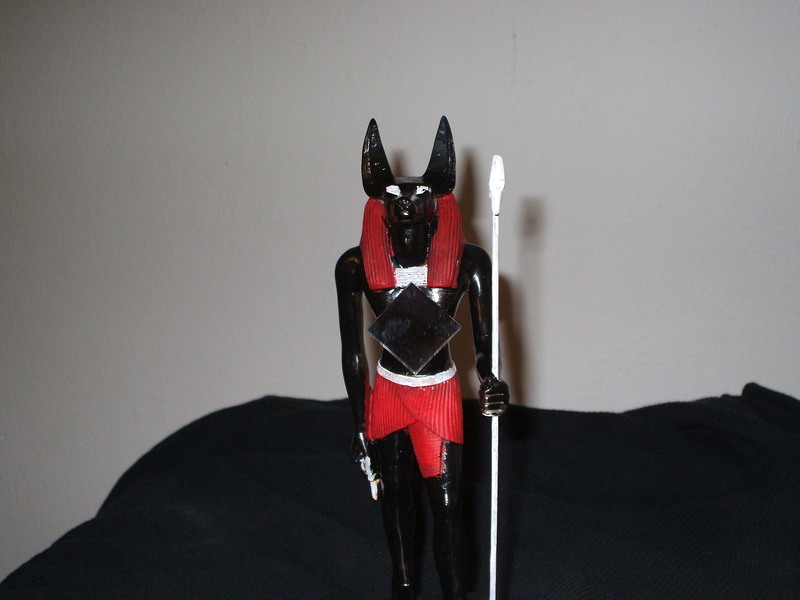 We meet the Divine Opener of the Way (also called the Divine Trickster in some traditions) called Npu (Anubis in Greek, Elegba in Yoruba, Lucero in the Palo Mayombe tradition, Moses in Christianity and Nino de Atocha in Catholicism). Who is Npu you ask? Without going into a long dissertation, Npu is the personal guardian angel/spirit that everyone has (regardless if they believe in him or not) given to us by God to guide us throughout life. He is envisioned as being a young man or teenager wearing a dog/jackal mask. The dog/jackal mask is a reminder to adherents to be specific with their request and careful what they ask for because if the subject matter is not black and white or if there’s any grey areas. You are bound to get a surprise because Npu can be very fickle and mischievous, which is the reason many assume that he is evil. But, Npu is not evil at all. He closes the doors (sort of speak) only to test our integrity and help us to learn about our own divinity. For instance, if I hadn’t been laid off after saying numerous times that I did want to go to work. I would never have learned that our thoughts influence our actions and just like negative thoughts yield negative results. Constructive thoughts can inspire constructive action. 1. State what you want, meaning focus only on the desired outcome and nothing else. If trying to recover from an illness don’t think about how you became ill or any of that other nonsense. Focus on enjoying your life and being healed. Try watching comedies to help you to keep your spirits up. 2. Allow the Spirit to intercede by sending you an inspiring message through Npu. 3. Follow the inspiration with action to get the desired result. Remember, you have to follow up with some kind of action to get what you want. If you don’t you are just a dreamer. One of my personal favorites is starting from the Finish Line. For instance, if you wanted to run a race don’t train to win the race, but instead train as if you have already won. Kamitic/Kemetic spirituality or way of life means a lot of things to a lot of people because Kamit/Kemet has and always will be a source of inspiration to generations and for generations to come. For some Kamitic/Kemeitc spirituality/way of life is an initiation system that focuses upon reconnecting to Nebertcher or God in order to expand one’s consciousness. With the sole hope of declaring before their life came to an end that they are Osar (Asar, Ausar, Osiris). For others Kamitic/Kemetic spirituality/way of life is about recreating, reconstructing and rebuilding the Kamitic/Kemetic society of old in order to restore Maa (balance, law, order, truth, etc.) to our hell bent society. But for the Land of Kam, Kamitic/Kemetic spirituality/way of life is all about assisting the individual to improve their daily lives through the power of God. Unlike other Kamitic/Kemetic inspired traditions that begin with the conflict between Hru (Hrw, Heru, Horus) and Set in the Story of Osar (Asar, Ausar, Osiris). The basis of the Land of Kam spiritual practice also called KAMTA (the Black Lands) centers around the pragmatic knowledge of the Kamitic/Kemetic people and their Story of Ra and Oset. Like most stories and traditions of indigenous people, the people of Kamit/Kemet’s beginnings is heavily influenced by how they migrated to the region, acquired food, whether by hunting animals or through agriculture, and developed into a peaceful society. According to the history of the Kamitic/Kemetic people, their country was divided into two regions due to the north flowing Nile River. The southern region of Kamit/Kemet was called the Upper Kamit or KAMTA (the Black Lands), which is where the name of this practice derives from. This region because the mouth of the Nile began in the south, had fertile dark soil, which made it possible for the Kamitic/Kemetic people to have lush crops, which naturally attracted lots of wild game that could be hunted. It was because of this rich fertile soil, the Kamitic/Kemetic people were able to develop the science of agriculture, which laid the foundation for them to become prosperous. The Kamitic/Kemetic people didn’t know how or why the Nile flowed from the south to the north (it was a mystery) but by observing the stars and the planets, they were able to mark when the Nile would flood, this eventually is what led to the people creating the calendar. The northern region of Kamit/Kemet that opened up to the Mediterranean was called Lower Kamit or TASETT (the Red Lands). This was because this region for the most part was very arid and the terrain was difficult to work. The lack of fertile soil made this what is imagined to be a very windy region that has the ability to dry one’s eyes, hence the origin of the Evil Eye. This coupled with the fact that nomadic warring tribes it appears fought constantly in this northern region for resources led to TASETT for the most part being seen as a harsh desert section of the country. So you see it was from this astute observation of nature, the southern region known as KAMTA called Upper Kamit was equated with fertility, prosperity, abundance, peace, blessings, stability, strength, water, night sky (heavens), mystery, the south, etc. While TASETT was associated with infertility, impotence, poverty, limitation, war, chaos, violence, fire, weakness, physical land, the north, etc. It wouldn’t be long afterwards that these influences would eventually be grafted into legends, myths and stories used to validate cultural practices. As time moved on it became general knowledge amongst the Kamitic/Kemetic people of the dyadic relationship that existed between the two regions. It was simple; it was always KAMTA/TASETT, mystery/known, secret/unveiled, invisible/visible, spirit/physical, dead/living, dark/light and night/day. The reader will note that this would appear to be a contradiction because you may have heard that Set was the devil and Hru was associated with the day. A thorough analysis of the Kamitic/Kemetic legends will reveal that this was not the case originally. Originally Set was good but eventually usurped by Hru who became associated with light and day and Set became associated with evil. Early Christians copied this word for word, which is why the devil in Christian lore was associated with being a good angel before being kicked out of heaven. Set still carries some of his old names as being the Lord of Light. Returning back to our subject, one of those stories that are often overlooked is the Story of Ra and Oset. The Story of Ra and Oset begins with Oset wanting Ra’s power so that she could become a divine being. She believed that if she could discover Ra’s real name, which he kept secret she could gain control over him and become as great as he. Through magical means Oset created a serpent and laid it upon Ra’s path so that when he came across it, the serpent would strike him and make him ill. When the poison of the serpent caused Ra’s skin to boil with fever and his bones to shake. Ra states that he has a “multitude of names and a multitude of forms”. As Ra grows weaker and Oset persists to ask him to give her his real name, Ra states all of the things that he has created and that he is Khepera in the morning, Ra at noon and Tmu (or Atum) in the evening. Finally, having no other choice, Ra secretly revealed his real name to Oset so that it would be hidden to others. He does so by transferring his name from his body to hers, thus revealing that Ra dwells within. Then the story ends with the impression that Ra’s real name had, not been revealed. In order to fully understand the story one has to have an understanding of the Kamitic/Kemetic language and philosophy. When Ra states that he has a “multitude of names and a multitude of forms”, it indicates that Ra is not the God or the Supreme Being as Egyptologists have claimed, but an attribute, part or section of the God. 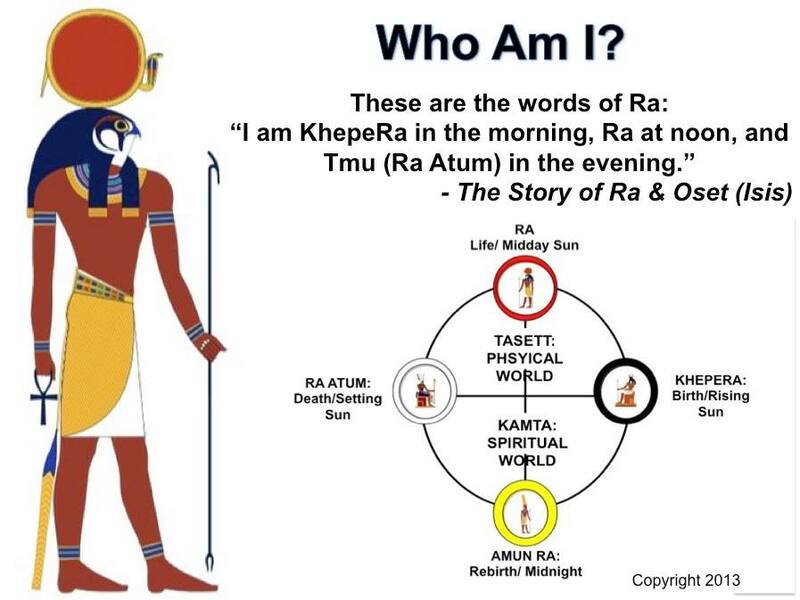 When Ra states all of the things that he has created and responds that he is Khepera in the morning, Ra at noon and Tmu (or Atum) in the evening. He reveals that he is not the sun but that his name is associated with the moments of the sun. In other words, his real name is what gives him purpose and declares what he is supposed to do. Finally having no choice and forced to give in to Oset wishes, when he reveals his real name to Oset he does so in secret by transferring his real name from his body to hers. We learn that the real name of Ra or the real Ra resides within. The real name of Ra is secret, hidden and is called Amun Ra, which means Hidden or Concealed Ra. The real Ra that Ra transfers from his body to the body of Oset derived from the Kamitic/Kemetic word “ra” meaning energy, power, strength, etc. It is the Kamitic equivalent of the Semitic “el” which means the same thing and is used the same way as prefix and suffix to various words. The real Ra that dwells within is the life force, the Holy Ghost, the Power or the Spirit of God that exists everywhere and in everything. 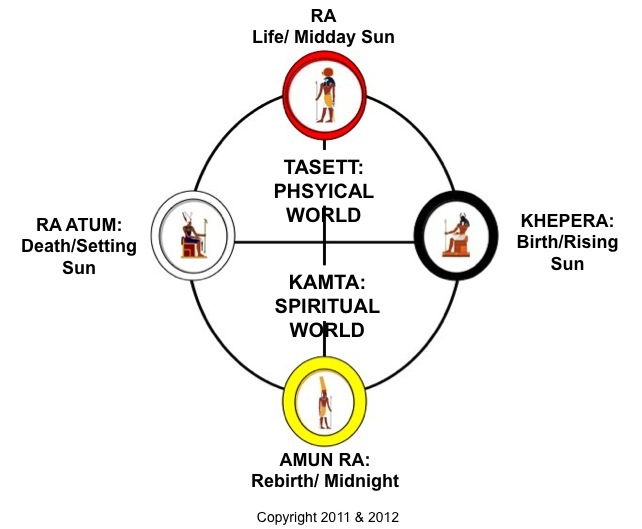 When all of this is taken into consideration, compared with other traditional African systems – particularly the Kongo Cross – and put together according to the moments of the sun: Khepera is marked by the rising sun (sunrise), Ra by midday sun (noon), Ra Atum by the evening sun (sunset) and Amun Ra by midnight. Together these four moments of Ra graphically create the cosmogram called the maa aankh. To the trained eye or the one who was biologically or culturally akin to the Kamitic/Kemetic people generally speaking Khepera is birth, Ra is life, Ra Atum is death and Amun Ra is rebirth. 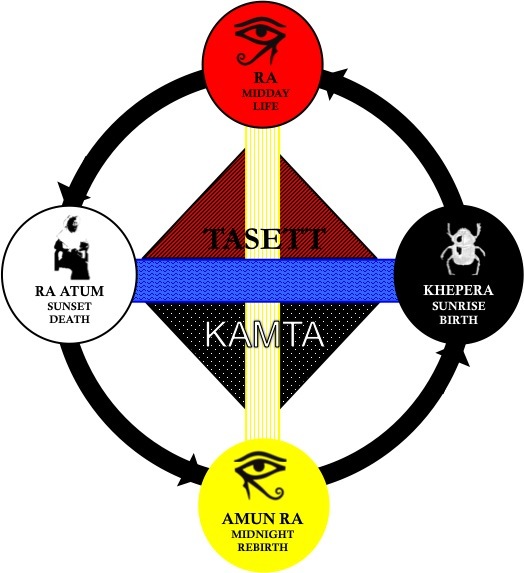 This is why activities pertaining to life in Kamit/Kemet were associated with Khepera, the rising sun and the east, which is where the practice of facing east derived from.It was originally done to initiate or stimulate rebirth. Today African American hymns still make reference to the east, just listen to the Winans song Tomorrow or Anita Baker and the Winans song Ain’t No Need to Worry. An analysis of the Kamiti/Kemetic culture will also reveal that activities associated with Ra Atum, the setting sun, and the west, were also associated with death, and so on. As you can see, the Kamitic/Kemetic people were a very ingenious group of people that tried as best they could to protect their country from foreign invaders from the north, which they associated with the color red, that the reader will recall was associated with the younger brother Set, Lower Kamit and TASETT. 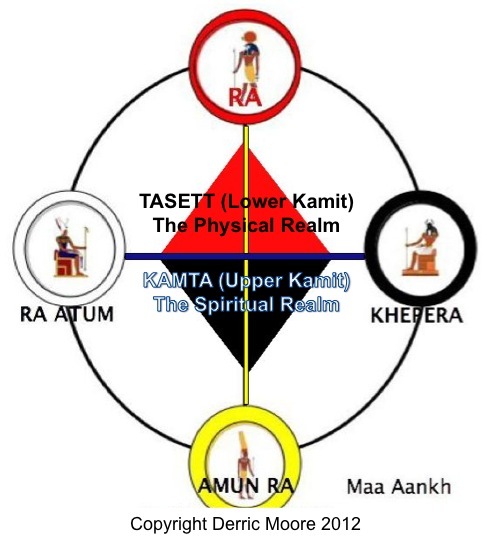 The two lands of Kamit/Kemet are likened to the head (upper) and tail (lower) of Rau, which was later adapted and modified to the Story of Osar (the older brother) and Set (the younger brother).The color white by the way is the color of wisdom, purity, knowledge and the honorable dead. The Kamitic/Kemetic peoples’ close observations of nature made them also observe what occurred within their being. It was understood that just like there was a KAMTA and TASETT that existed physically, KAMTA and TASETT also existed spiritually within man and woman. A man or woman that was peaceful, prosperous, righteous, truthful living, God fearing, fertile, disciplined, etc. was viewed as being influenced by KAMTA and associated with the “individual” called Osar. A man or woman that was untruthful, disrespectful of God, impotent/infertile, lacked self-discipline, a warmonger, rash, impoverished, etc. was said to be influenced by TASETT as was associated with the energy Set. According to history one of the first Kamitic/Kemetic individuals associated with Osar was the first dynasty ruler named King Menes/Narmer. It is not known who was the first individual to become associated with Set, what is known is that Set later became Set-an and finally the Christian Satan. 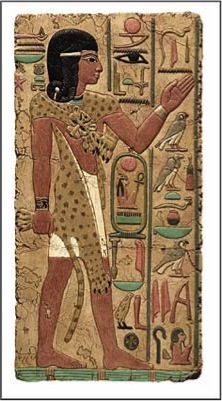 Because King Menes/Narmer was a physical, living human being, it disputes the popular claim that the Kamitic/Kemetic people worshipped gods and goddesses. A thorough analysis of their culture and the grand edifices that continue to stand that are actually memorials. Reveals that what Egyptologists call gods and goddesses are actually categories for particular ancestral spirit. In other words, King Menes/Narmer became associated with Osar, which the reader will recall is associated with KAMTA (mystery, stability, strength, prosperity, peace, etc.) because he unified the country in the most peaceful way that he possibly could thus bringing prosperity. He was therefore revered as an ancestor, meaning Osar and all of the other so-called gods and goddesses of Egypt are actually guardian spirits. This is the reason why throughout Kamit/Kemet there are images of these spirits guiding and performing tasks like any other angelic being. When we compare this to other African traditions with similar cultural practices and observe how it exists in contemporary times, it becomes clear what is Kamitic/Kemetic spirituality. The real Ra or Rau within which corresponds to the Holy Spirit and Power of God, is all knowing, omnipotent and omnipresent because it is what is called in Western psychology the super conscious, the collective unconscious or God. It is a mystery, which is why the Kamitic people associated it with KAMTA. The subconscious, which is the part of our being that corresponds to our personal memories, habits, etc. they associated it with TASETT. It must be remembered that KAMTA and TASETT are also called the Upper Kamit and Lower Kamit, psychologically speaking what is termed today as Higher Self and the Lower Self. Psychologists will tell you that the superconscious and the subconscious work together. Deep, intuitive messages come from the superconscious and are received in our subconscious as inspiring thoughts and actions. This is why the Kamitic/Kemetic people understanding the connection between the subconscious and superconscious, likened with the unification of KAMTA and TASETT. This is classic ancient African thinking that from the spiritual comes the physical, from the unseen comes the seen, the head to the tail, from the feminine principle comes the masculine principle, from the invisible comes the visible in order for there to be life, and so on, is all symbolized as the unification of KAMTA and TASETT. The way to engage the superconscious and subconscious together is through conscious effort, which is how Khepera, Ra, Ra Atum and Amun Ra come into the picture, because they all correspond to our conscious mind, the rationalizing aspect of our being, which is our Soul. When our Soul is at the Ra and Ra Atum moments we have difficulties because are attention is focused on the physical, the material, the things of the world, the limitations that exist in TASETT. When our Soul is at the Amun Ra and Khepera moments we are in the most receptive states and are able to receive guidance from the Rau. This is because our attention is focused on the whole perspective (spiritual/physical) and is opened to the endless possibilities that exist in KAMTA. The night sky is the limit or NO LIMIT. What this means is that the Kamitic/Kemetic Way of Life in simple terms is all about listening and being receptive to the Rau – the Holy Spirit of God and the emissaries of the Rau, which are our aakhu (ancestors) and netcharu (guardian spirits). When you are receptive to the Rau, the Rau (remember, being all knowing, omnipotent and omnipresent) will show you how to accomplish any and all of your objectives in life. If you have ever went to sleep with some thing on your mind and awoke with an answer, that answer came from the Rau – the Divine Spirit of God within our being that is connected to every living thing on the planet. Have you ever had a dream and in the dream you saw a deceased relative tell you something or your awoke from your dream with new insight on how to accomplish something, because you saw the deceased relative? This was your aakhu (ancestor) interceding on your behalf or delivering a message from the Rau. It is that simple and if you trust in the Rau the Rau will show you how to achieve any objective. If you state what you want to the Rau, the Rau will deliver it to you, which is why Jesus called the Rau – the Power and Spirit of God, the Comforter. The Kamitic/Kemetic people understood this and this is why they categorized their ancestral spirits the way they did. It was by observing nature they began to see a pattern and they recognized that when they said something that they didn’t really want it corresponded to Npu (Anpu, Sobek, Sebek, Anubis). Hence, the saying, be careful what you ask for you just might get it, but when they said something that they wanted. The Rau would provide them with an Npu guardian spirit that would help them to get what they want ethically, morally and without harming others. They understood who and what the Rau is and they knew, what prevents most people from achieving true happiness, peace, wealth, health, etc. is their ability to follow the Rau due to their fears, inhibitions, and past experiences. All of these inhibitions correspond to TASETT or what older African Americans would call the blues or negative spirits the Kamitic/Kemetic people called aapepu influenced by Set. People want to debate if spirits are real or not. If you want to know if a negative spirit is real all you have to do is say that you are going to do something positive and I guarantee you, you will have a bunch of energies/forces that will try to stop you. So to remind people that they are made in the image of God and that they are the controllers of their destiny, they built their civilization around the maa aankh. Understand, at present besides the ankh or aankh symbol (which symbolizes the rebirth of one’s conscious or being “Born Again” there are no artifacts that have been found suggesting that the Kamitic/Kemetic people had a maa aankh, but do you know what? There probably never will be a diagram found, because as stated before the Kamitic/Kemetic people lived it and like the Kongo-Bantu people their society revolved around it. For those who need more proof, simply study the Kamitic culture and you will find that it corresponds to the various moments and philosophy. As to why the maa aankh exists today it is because I asked the Rau – The Spirit for a tool to help me improve my life, because I was in dire need. After benefiting from it, I was given the task to share it with others because our families, community and society are also in bad shape. Simply put, God and our ancestors needs individuals who aren’t afraid to stand for truth and invoke (or conjure) the power of God on point to give people encouragement, inspiration and power to take back their life from Set and the aapepu. KAMTA is a different form of spirituality because it approaches the Kamitic/Kemetic way from an oppressed person’s perspective, like the hero Hru fighting to reclaim, attain and maintain his or her heritage. This unique perspective can not be learned by solely by books. It requires that one take a walk on the other side – KAMTA – in order get a full picture or holistic view of life. This is why the basic mission of KAMTA is to help people with their everyday trials and tribulations by invoking the power of Nebertcher in their life.